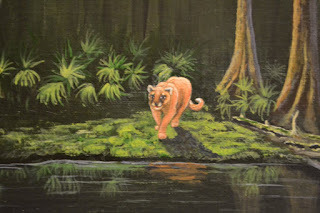 I just finished my "test" or smaller version of my Florida Panther. It came out pretty well. It is 11 x 14. The larger painting will be 20 x 24. I took several pictures of my progress so you can see how it developed. As you can see here (hopefully, shouldn't have used flash) I underpainted in mostly hookers green deep, added some purple, blue and then added some cad yellow in the center area of the sky. I was careful not to totally blend the colors. 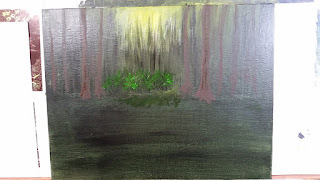 Then I took my brush a #6 bristle and hookers green plus burnt umber and streaked in basic tree trunks. Then I under coated the bottom half in all hookers green and then let it all dry. 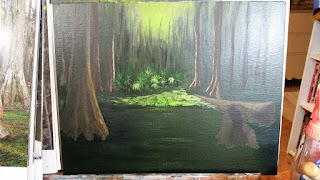 Next I added more tree trunks, mixing green and umber and then painted in some needle palms or palmettos. and some grass underneath. Always careful to not cover up all the under painting. Here, I lightened the grass. 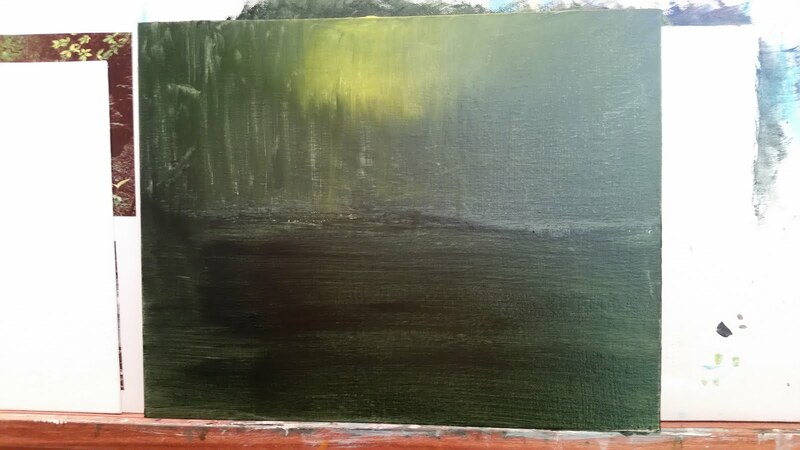 this is a backlit painting so all the grass in the foreground is light. As you can see here there are dark and light areas. Actually, this is more moss as it is a swamp area, The Everglades. All the foreground will be water, the trees are cypress. 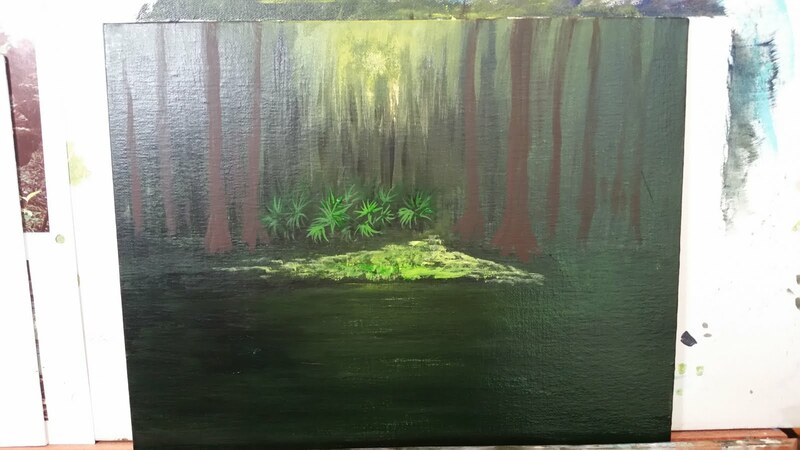 I added more trees, again, Cypress. If you aren't familiar with this tree, you can google it for plenty of photos. This is the underpainting. I also began highlighting the background trees. It is funny how it works, but as I took these pics I see mistakes and that is a good thing! I can go back and correct them in my next sitting. I also highlighted the palmettos. I painted the dead tree to point toward the center of the painting. That is a composition factor. Everything should move your eye toward your feature or center of focus. This dead tree does the job nicely! This is the final product. 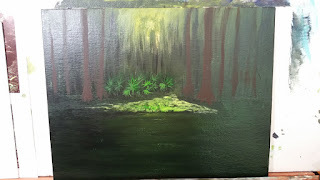 I went over the trees highlighting several times, and I changed the stump. I didn't think it fit with the dead trunk. Now they seem to go together. 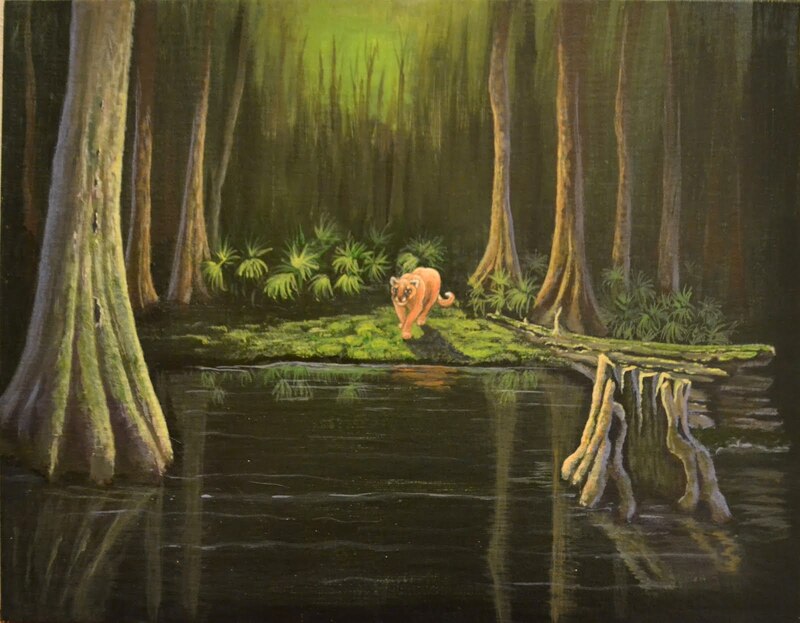 I added the panther walking toward the water. 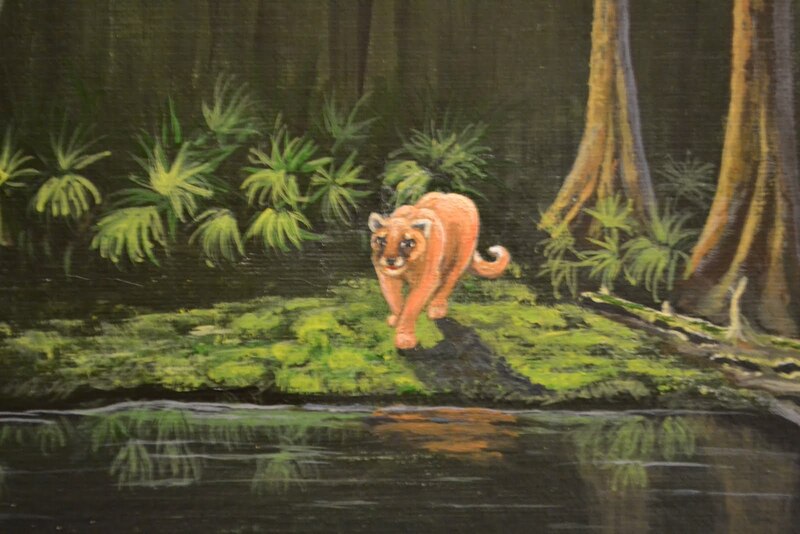 I found photos of panthers and practiced drawing till I was happy with it. Then, drew it in with charcoal. 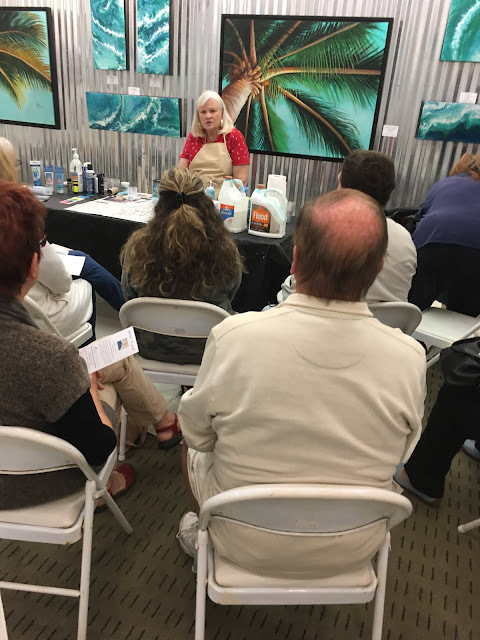 Be sure to get your reflections in the water of anything above the water! that is what makes it look wet!! Then I painted very fine lines of purple mixed with white to show movement. 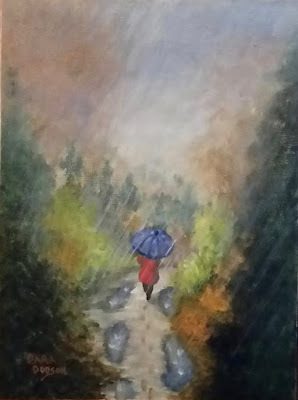 Since posting this photo, I had another artist critique this painting. He kindly pointed out to me that my shadow under the panther is incorrect. My light source is from directly behind the cat. My shadow, on the other hand, goes off to the right. Oops!! So, I got busy and reworked the shadow, toned down the large tree on the left (too bright) I also decided to lengthen the legs of the cat slightly and added his reflection in the water and, at the suggestion of my sister, added three turtles sunning themselves on the dead tree. So cute! 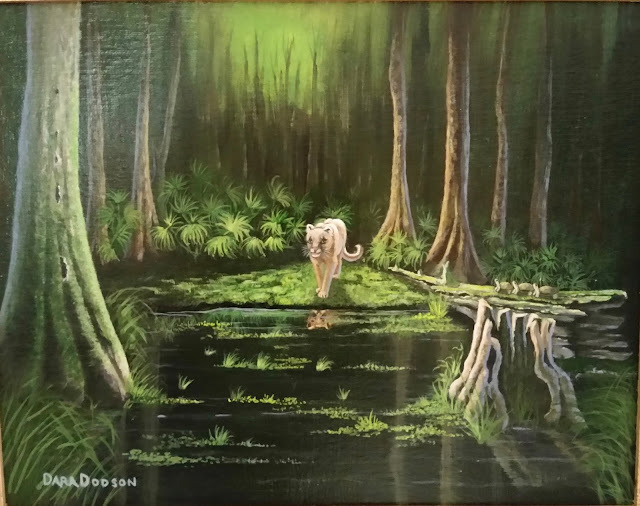 I had planned to add some grasses to the water but jumped the gun and took the photo before. So next you will see the ACTUAL finished photo of the painting! LOL!! See if you think it is an improvement. Small details can make a huge difference, after all.